NEW Indigenous Knowledge CoP Video Series! A NEW Video Series is now available from our Indigenous Knowledge Community of Practice! 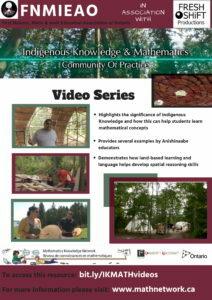 The videos highlight the significance of Indigenous Knowledge in mathematics, provide several examples of Anishinaabe educators, and demonstrate how land-based learning and language help develop spatial reasoning skills. Please share the flyer below widely, and check out the videos at bit.ly/IKMATHvideos! For an overview of the IK CoP, check out their new Flyer below! 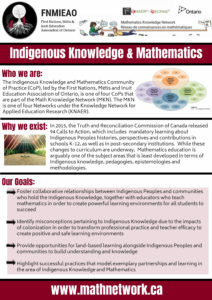 For more information, visit their page at mathnetwork.ca/indigenousknowledge.